Android KitKat will let users decide what app to use for sending and receiving text messages rather than automatically defaulting to the classic Android Messaging app. Once KitKat lands on Android handsets, users will be able to choose a default SMS app for themselves from within system settings. The upshot for devs is that they need to adjust their hidden SMS APIs, for which full instructions are given in the blog post itself. In the post, Android reps outline what devs need to do to ensure their SMS apps are ready for the KitKat release, whenever that may be. Previously apps were able to handle text messages in this way, but now that task will be set to one default app in the settings. 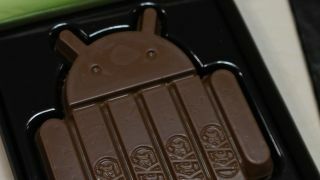 While it doesn't contain any concrete information about when KitKat is likely to launch further than "later this year", the post does "encourage" devs to update apps "as soon as possible" which suggests that the Android 4.4 launch will be soon. Indeed, we're expecting KitKat to be unveiled this week alongside a new Nexus 5 handset. What's that? You want to know everything there is to know about the new Nexus 5?